Some extraordinary claims have been made about a number of reliefs carved on the walls of the Temple of Hathor at Dendera, Egypt. It is alleged that Egyptologists are at a loss to explain them, while electrical engineers have been able to recognise them as Crooke’s tubes (an apparatus resembling the electron tubes found in televisions). Each ‘tube’ contains a wavy serpent running the full length inside; attached to it is a braided line, which Alfred Bielek (otherwise known as Ed Cameron, born 1916) has identified with engineering illustrations used today for representing a bundle of wires. In some of the representations, the ‘tubes’ each rest on a djed-pillar, identified by Bielek as a high-voltage insulator. There are two major problems for the technological interpretation of these reliefs: the context of the temple’s construction and the texts that surround and describe the reliefs. The temple is full of inscriptions that enable us to date its construction to 54 BCE in the reign of Ptolemy XII. This places it firmly in one of the best recorded periods of ancient history and in the one country where documents detailing the minutiae of everyday life have survived. Not once do these documents talk about any technology that matches what Bielek sees in the reliefs. The clinching part of the argument is what the texts describing the reliefs talk about. 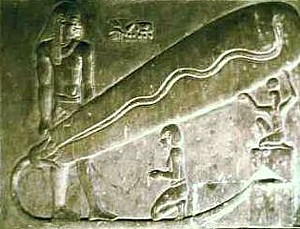 The supposed Crooke’s tube is mentioned in the texts describing the scene as a sun barge, the boat in which the sun god Ra‘ travelled across the sky. The form of the barge is in no way unusual. In many representations, the solar bark consists of a string like object with a bow and stern, while gods and objects connected with the sun or the sunrise stand on the horizontal platform. One of these objects, usually seen at the stern, is the lotus flower, which is what Bielek describes as the lamp socket. Understanding the conventions of Egyptian art is important to unravelling the ‘mystery’: they are not technical drawings, nor are they photorealistic depictions of the world. Instead, they are symbolic diagrams intended to be interpreted with the help of the bits of text that surround them. Superficial resemblances to twenty-first century technology have no relevance to their true meanings. On a more technological side, a Crookes tube does not physically look like what is described in the carving- there is no coil of wire inside the tube, there must be a second electrical connection on one side (the “device” in the carving is not even a complete circuit), and any electron beam visible in the tube itself would not form a wave. I’m not familiar with the notation involved, but while that symbol could conceivably be used to denote some kind of vacuum tube or lamp, it would be an arbitrary symbol with no physical basis, meaning it wouldn’t have existed before the notation was developed in probably the early 20th century. Just being thorough. Excellent debunking.